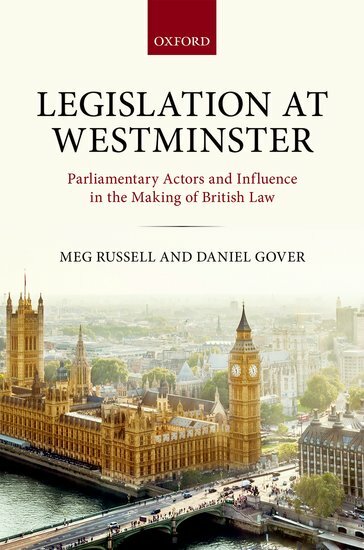 In Legislation at Westminster: Parliamentary Actors and Influence in the Making of British Law, Meg Russell and Daniel Gover offer a comprehensive and empirically rigorous assessment of the role that parliament plays in the UK policy-making process. This is a meticulously researched book, writes Ed Page, that is a must-read for both students and scholars wanting to better understand how laws are put together and how parliament really functions. Legislation at Westminster: Parliamentary Actors and Influence in the Making of British Law. Meg Russell and Daniel Gover. Oxford University Press. 2017. The high dramas associated with vulnerable parliamentary majorities and assertive legislators, of which the Brexit Bill is a recent and powerful example, certainly remind everyone that parliament cannot be taken for granted. Yet the view persists that in ‘normal’ times, parliament’s role is limited. The importance of Legislation at Westminster: Parliamentary Actors and Influence in the Making of British Law is that it does so much more than provide a corrective to the widely-held view that the UK parliament makes little difference to the eventual shape of policies. Rather than trying to send you away with the message that you can find pockets of political activity in which parliament bucks the general trend of executive dominance, it offers a comprehensive and empirically rigorous assessment of the place of parliament in the policy-making process. In a nutshell, parliament is central to a variety of different types of politics, including the executive politics of managing legislation, the politics of intra-party relations, the politics of opposition, the politics of interest group lobbying and the politics of scrutiny. Each of the forms of politics has its own norms, procedures and logics. Unless we understand these, and the role of parliament as a central arena in which these politics play out, we cannot understand how policies are put together. This book shows you how these different forms of politics work and the impact they have on the final shape of legislation. The basic design of the research on which the book is based is simple and effective. Meg Russell and Daniel Gover take twelve pieces of executive-sponsored legislation, seven from the 2005-10 parliament and five from the 2010-12 session. They look at, and where relevant code, all the documentary evidence on these bills – the debates, amendments (proposed, withdrawn, defeated and passed), reports and votes – and interview 120 key players (MPs, ministers, civil servants, parliamentary staff and interest group representatives). They use this material in seven substantive chapters looking at the strategies and tactics used by the executive, opposition, government backbenchers, ‘non-party parliamentarians’ (above all, crossbenchers in the House of Lords), pressure groups, select committees and cross-party groups. The central message of each of the substantive chapters is that the different groups examined have varying objectives, time horizons, resources, allies, constraints and tactics, and this makes the politics of the legislative process look very different for each of them. To take but one example, the opposition proposes amendments not only to change a Bill, but for other purposes – including information seeking, communicating with a wider non-parliamentary audience (‘signalling’), embarrassing or otherwise harming the government (‘gameplaying’) and seeking to manipulate procedures to their advantage. Government backbench amendments have a different character: ‘signalling’ often means distancing from government policies to an outside world and had special attractions for Liberal Democrat backbenchers under the coalition government of 2010. Some backbench amendments are proposed so that officials will brief the minister on the issue. So even if the briefing is a prelude to the minister dismissing the proposal, the issue is on the agenda and is, so the calculations go, easier for the MP to pursue later. The politics of the legislative process depends on whose perspective you look at it from. The research that has gone into this book is meticulous and extensive. It is also worn refreshingly lightly. Russell and Gover avoid what must have been a huge temptation to blow loud trumpets about how painstaking some of the research actually was. For instance, in the chapter on select committees, usually considered to be largely outside the main production line of legislation (though the authors show exactly why this is incorrect), Russell and Gover, among other things, code mentions of select committees in Lords and Commons debates on their twelve pieces of legislation, review hundreds of ‘policy strands’ in select committee reports and look at the correspondence between committee reports and proposed amendments. Similar detailed examination of huge amounts of evidence can be found in all of the chapters. As they suggest occasionally, the evidence is sometimes hard to come by and requires the exercise of judgment – for instance, no metrics allow you to establish the number of select committee recommendations that find their way into legislation via amendments. The impact of anticipated reactions, which appears with some frequency, is especially difficult to assess. But even in such cases, the authors’ measures and assessments are far closer to ‘beyond reasonable doubt’ than the ‘balance of probabilities’. It is worth noting that the simplicity and effectiveness of the basic design and the clear style in which the book is written mean that it can serve as an introduction to how parliament works for students at all levels. Little prior knowledge of parliament is assumed: this means that the reader is taken through basic structures of the legislative process, but Legislation at Westminster also contains clear explanations of what might be termed ‘intermediate level’ parliamentary procedures (guillotine motions, programme motions) as well as advanced level material, such as the finer points of ‘paving amendments’. This remarkable book is a must-read for anyone wanting to know how laws are put together or how parliament really works. Especially those of us who thought we knew already. Edward C Page FBA is Sidney and Beatrice Webb Professor of Public Policy, London School of Economics and Political Science. He writes on British and comparative public policy and administration. His past work includes several studies of the process of lawmaking, including Governing by Numbers (Hart, 2001), Policy Bureaucracy: Government with a Cast ofThousands (Oxford University Press, 2005) and Policy Without Politicians (Oxford University Press, 2012).